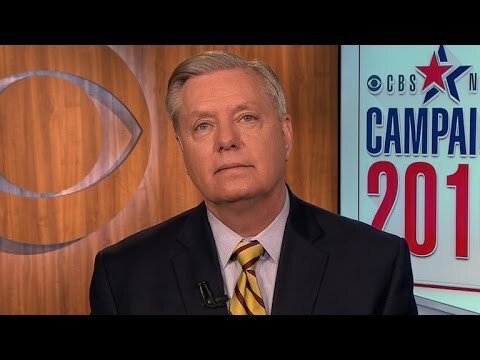 Lindsey Graham has been posing as the voice of reason in the Republican Party for the past few weeks, warning Tuesday that if Donald Trump gets the Republican nomination and Hillary Clinton is the Democratic standard-bearer, then “crazy loses to dishonest” in the public’s eye. There isn’t any real evidence that Hillary Clinton is personally dishonest in the way that Graham is charging. She’s just a politician. But of course there is a lot of evidence that Donald Trump is unbalanced. The problem is, Graham and many other members of the Republican Establishment are blind to the ways in which the Trump stances they call crazy are mostly simply explicit statements of what they say with dog-whistles. Or they employ the same rhetorical tricks but apply them to what Graham thinks are the wrong targets. Graham complains that Trumps speaks in a bigoted way about Latinos, who he says are the fastest-growing part of the electorate. He is frustrated that Trump is chasing away a key demographic. But Graham himself has called Middle Easterners all “crazy” and characterized Iranians as all “liars.” He made the latter slur in order to argue that diplomacy could not succeed in dealing with Iran. But the Iranians did concrete in their planned heavy water reactor and met every other obligation of the JCPOA agreement with the UN Security Council. After the Dylann Roof shooting at Emanuel ME Church in Charleston, Graham opposed removing the Confederate flag from the statehouse grounds, on the grounds that it represented ‘who we are.’ But 66% of SC African-Americans wanted it gone, and SC is the state with the largest proportion of African-Americans in the country (if they were actually enfranchised Graham wouldn’t be senator). What’s the difference between championing the flag of a slave-holding breakaway state and equivocating over whether to condemn the KKK? For Trump to make blanket statements insulting a whole ethnic group is just standard operating procedure in the GOP. It so happens that he targeted not only Muslims (as Graham himself did) but also Latinos (whom Graham thinks his white elite needs as lesser clients to outvote African-Americans and white union workers). But if you can casually smear a whole ethnic group of any sort, then what stops another party member from doing it to the groups you think you need? Trump isn’t acting differently from Graham in principle, only in denigrating a different ethnicity. It is Prejudice 101 that it is always illegitimate to issue a blanket condemnation of a large group of people based on ascriptive identities like ethnicity or religion. You can condemn some individual on the basis of an acquired identity, e.g. ‘bank robber.’ If a person decides to rob a bank, you can castigate that person as dishonest and a thief. But you can’t assume that his mother or brother is dishonest. And you sure as hell can’t assume that, if he is a Methodist, all Methodists are bank robbers. I mean, this is the basic ethics taught in kindergarten. Trump is still an ethical babe in arms, not having reached the level of kindergarten in his morality. But in this regard, if we are speaking of the principle of the thing, Graham and many in his party just aren’t any different. Most of them speak in this prejudiced way, or use dog whistles to imply it. Graham admitted that he could be persuaded to support Ted Cruz. If that’s not crazy I don’t know what is. Just last November, after the Russians had intervened in Syria, Lindsey Graham called for putting 20,000 US troops on the ground in that country. On this issue, Donald Trump, who is generally certifiable, is actually much less crazy than Graham. Iraq had not attacked the US in 2002, and as a ramshackle, sanctions-ridden poor third world country, was not in a position to attack the US. So how was a nuclear power of 300 mn. people just falling on a defenseless little country of 25 million an act of ‘self-defense’? Blowing off the disapproval of the rest of the world is a form of American exceptionalism. It is a way of saying that the US treaty obligations under the UN charter, which forbids aggressive war, are a dead letter. Because ‘Murcans. So when Trump says he would kill the families of terrorists or would go well beyond waterboarding in implementing torture, he is using the same logic as Graham used to promote the disastrous and illegal Iraq War. Graham opposes torture and waterboarding, but he doesn’t oppose the ‘my country right or wrong’ form of argument that Trump has adopted. Graham pressed the case for a war on Iran with Secretary of Defense Ash Carter last summer. Iran is three times more populous than Iraq and is a much bigger country. If the US could not succeed in Iraq, a US war on Iran would be three times as bad. It is hard to see how the US economy could survive a $9 trillion war. So Graham himself just talks bigotry or insanity. All Middle Easterners are crazy. All Iranians are liars. Poor weak countries half a world away are menacing us such that we have to militarily occupy them. War with Iran is another cake walk. That Graham looks at Trump and sees someone speaking in a completely different diction from himself, or hears the crazy in Trump’s pronouncements but not in his known, just underlines how hard it is for us to estimate our own failings.